What are the best cocktail bars in Covent Garden? From secret and quirky bars to glam hotels, find out where to go for cocktails in Covent Garden, London. When it comes to nights out, Covent Garden is one of my favourite areas of London. It’s a sophisticated part of the city, with its old piazza, smart restaurant scene and theatres. Yet, when it comes to bars, there’s a bit of everything! You can go grungy at Roadhouse, enjoy the finer things in life at The Savoy or delve into the unknown in hidden bars like Blind Spot. On a budget, or just love a bargain? Time your visit for one of the top value happy hours at Be At One, The Escapologist or Mabels. I’ve tried to really hone in on Covent Garden for this post. No bars in Soho, Trafalgar Square or Oxford Circus. These options stretch from St Martin’s Lane to Seven Dials and the Strand. Some are better early in the evening, while others give you a flavour of Covent Garden nightlife. So whether you’re planning a quick drink with friends, a romantic date night or the party to end all parties, here’s my guide to where to go for cocktails in Covent Garden, London! Once Adventure Bar (the location of many of my birthday parties in my 20s!) Blame Gloria is the place to go for a night packed with fun. Who’s Gloria? According to the website, she’s the one who throws the wildest parties. Ohhhh, THAT Gloria! The menu is wild here too, with flaming zombies, vodka infused with Skittles and drinks garnished with everything from edible flowers to Parma Violets. Another bar filled with happy, rum-infused memories for me, this was often where I’d head after work on a Friday for a few cocktails with work friends. It’s the original bar of the successful London Cocktail Club group, and while space is limited, there’s always a great vibe inside. 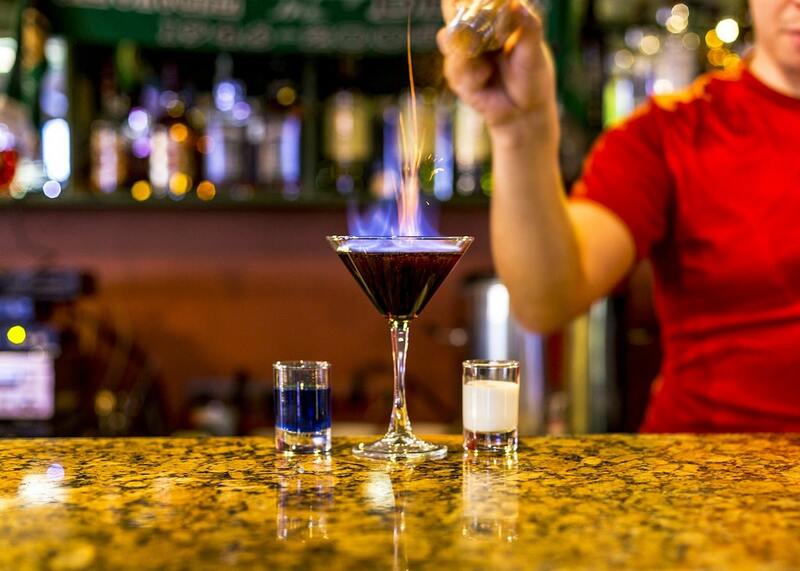 The cocktails are seriously good, and you can expect some bartender flair skills on show too! Say hello to the oldest surviving cocktail bar in Britain, opening its doors in 1893. You’ll feel like you’ve stepped back in time as you enter The Savoy’s smart bar, enjoying the sounds of a live jazz pianist as you sip on an expertly crafted cocktail. The American Bar was voted the World’s Best Bar in 2018, so you can expect to taste well-balanced, delicious drinks if you take a seat here. Prices reflect its prestige, but it’s worth it! Oh and it’s the perfect spot for a romantic date in Covent Garden. Mystery and magic work hand in hand at this underground bar in Covent Garden. I visited Eve for the first time a few months ago, finding it purely by chance. The steps to the basement were covered in apples, there was no menu outside, but with a bit of dutch courage, a friend and I ventured down and found a super cool hidden bar serving creative cocktails in a candlelit setting. Since then I’ve found out that the bar is part of top chef Adam Handling’s little empire (he also runs Frog, Restaurant Adam Handling and a few others). It’s a cool spot, and one you might never stumble upon if it weren’t for my little recommendation! Is Roadhouse one of the best bars in Covent Garden? Erm no… but it is a good laugh! With its American diner meets Coyote Ugly feel, nightly bands and crowd pleasers like rockaoke and lipsync battles, it’s a great party bar. Don’t go too early, I feel like this is for later in the evening when you’re craving some Covent Garden nightlife. Tucked inside the 5* St Martins Lane Hotel, Blind Spot is set behind the façade of a tea counter and is one of the closest places to a late-night speakeasy that you’ll find in Central London. There’s a themed menu, with cocktails featuring flavours influenced by the British Empire and its ancient tea trade. There’s also a cool programme of live music, DJ appearances and events throughout the week. The food looks appetising too, with a mix of burgers, pasta, nachos and more – all helpful for soaking up the booze! But wait, isn’t Grind one of the best coffee shops in Covent Garden? Errr, well actually, after dark, Grind turns sexier and cooler, as the classic espresso is swapped for one of the best espresso martinis in the city. They serve up a tasty menu of light bites, brunches and snacks, plus plenty more cocktails that pack a punch. While it’s not in a particularly ‘secret’ location, Grind is a great option when other Covent Garden bars are busy, as I don’t think people think to try somewhere that looks like a cafe. Hurrah for fun cocktails! I love a novelty drink from time to time. Yep, they’re not always the flavours you’d choose, but they froth, or fizz or change colour, and sometimes that’s EXACTLY what you want! If you love that too, then head to The Alchemist on St Martin’s Lane. 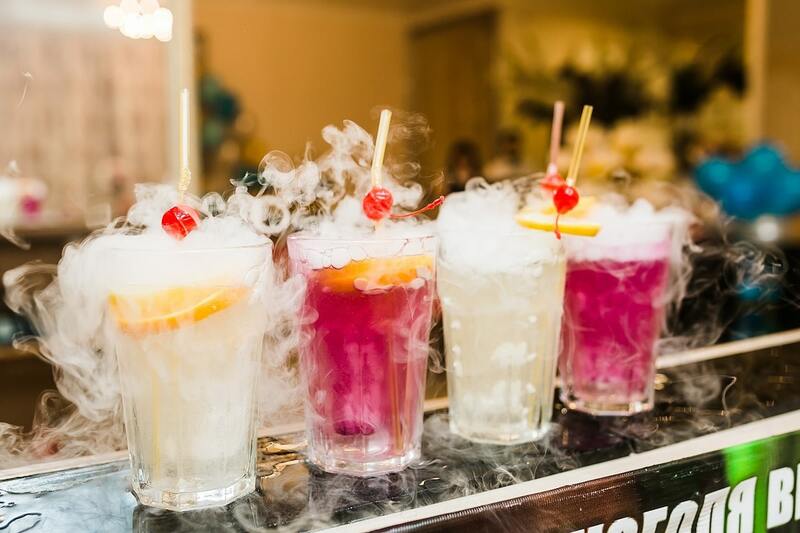 Choose from drinks like Bubblebath (which claims to contain fairy liquid), Chai Iced Tea (which is served smoking), and the Colour Changing One (which, you’ve guessed it, changes colour using ‘magic’). There’s also a tasty food menu too, you know, incase you need to soak up any of that ‘magic’. Who remembers Foundation Bar in Covent Garden? The scene of many leaving dos and birthdays for my friends and colleagues in London, it was always a lively party bar in Covent Garden. Well, it’s all change as it reopens in April as a new branch of popular cocktail chain Be At One. Known for having one of the biggest cocktail menus around, you’re guaranteed to find something you like at Be At One. They also have a great happy hour, and it’s worth looking at their App too, as it allows you to start your own happy hour. I’m excited to check out this new location soon – see you down there for 2 for 1 passionfruit mojitos? With several bars across London, Dirty Martini have nailed the classic London cocktail bar. ID on entry, strong, well made cocktails, and a party atmosphere. They’re often tiny bars, tucked away in basements, so you don’t quite know what you’re about to enter when you go in. This one, just off Covent Garden’s piazza has a great happy hour, and when I last went (on a Tuesday around 8.30pm) had VERY loud music. It’s not a great place for a chilled catch up with friends unless you’re happy to strain your vocal chords in the process, but you can guarantee great martinis and a party vibe. One of the coolest cocktail bars in Covent Garden, The Escapologist doesn’t take itself too seriously. In fact, it claims to be the place to ‘party like its 1899, seven days a week’. I’ve always loved the Seven Dials area in Covent Garden – feels just far enough away from the touristy part around the piazza to get an authentic London experience. There’s a daily happy hour from 5-7pm, and a fun menu of cocktails with all the classics, and a fair few twists too. The entire room is clad in a dark wood, with portraits on the wall, giving the feel of an old gentleman’s club. This Covent Garden rooftop bar has one of the best views of London. Sip on a martini while looking out at the London skyline? Yes please! On the 10th floor of the ME Hotel, this is one of the smartest bars in Covent Garden, and while the drinks come at a premium, they’re worth it for that view. You can also order food, enjoy afternoon tea here, or book the room for a private party. I’ve been here for casual Friday night drinks and also several events, and it’s always been a fab spot. If you love all things latino, then this is the Covent Garden cocktail bar for you. It’s located underneath Floral by LIMA – the sister restaurant to Michelin starred Lima London. The Latin American menu brings flavours of Peru, Mexico, Brazil and beyond, with intriguing pisco sours, tasty rums, mezcals and tequilas. There’s also an enticing menu of bar snacks, which I’m now dying to try, including Peruvian fried chicken with a lemongrass dip, yuca fries and beef empanadas. Considering this restaurant serves some of the prettiest food in Covent Garden, you just know the cocktails are going to be special too! I hope this has helped you decide where to go for cocktails in Covent Garden! 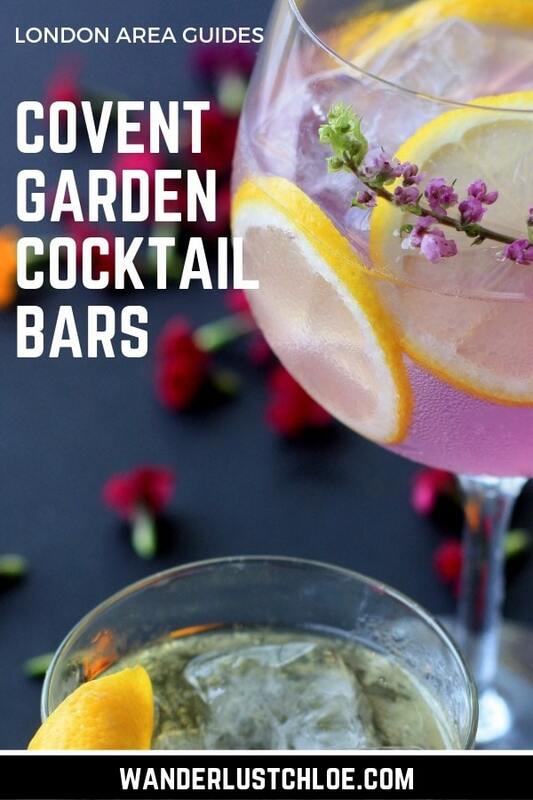 Let me know which Covent Garden bar is your favourite… or why not set yourself a little challenge to try them all! I’ll join you if you like…?